Published short-story writer and friend of The Artifact, Michelle Sussman, has just started up a blog called Michelle Sussman’s Novel Idea. It will track her progress as she writes her first novel and give us an inside look at the process a writer goes through to create something out of essentially nothing. Join Michelle as she takes you on a fantastic journey on her blog and in her debut novel … one chapter (and one post) at a time. It’s been said that dreams only can be had while you sleep, but we have proved that by dreaming big and stretching as far as your imagination can go, a dream can be made a reality! I wish to publicly thank my fellow writers, my friends for life. As THE ARTIFACT: AN ANTHOLOGY passes all our expectations, first premiering on Createspace, then Amazon.com and now on to Target.com, into our local bookstores and hometown libraries, for never wavering from the dream. For writing through, pushing on, and pursuing this dream of ours with a passion. Allowing not only the energy of the universe to lead us, but also the strength of true friendship to fuse us into an unstoppable force. Taking on new strides in the writing industry, and under the banner of G10, undertaking bigger and more profound challenges that will permit the dream to continue ONE SUPERLATIVE LEVEL AT A TIME! JANE VASCO lies on an examination table. Her arms, legs, waist and forehead are secured by leather straps. She struggles to move. Wearing the scrubs of a surgeon, DEREK SUMNER circles around Jane. His face is covered with piercings (ears, nose, eyebrows, lips), a black tribal tatoo, scarification and other body modifications. I assure you, Jane, you will be unable to escape. They’ll what? Kill me? Come now. Idle threats don’t scare me. He runs his finger down her cheek, then SCRATCHES HER WITH HIS FINGERNAIL. Jane winces in pain as a drop of blood trickles down her cheek. Soon after, the scratch disappears. It has completely healed. You see, you and I have something special in common. He picks up a scalpel lying in a tray. He brings it to his wrist and cuts across. His face remains stoic. Jane’s eyes go wide as blood flows out of Derek’s wrist before the wound quickly heals. Except that, unlike you, I don’t feel pain. Congenital analgia, they call it. And unfortunately my attempts to find a cure have been unsuccessful. As Derek turns his back on her to scrub his hands in the sink, Jane takes a moment to take in her surroundings. AROUND HER ARE SEVERAL GURNEYS WITH BODIES COVERED IN SHEETS. I take it the DOAs are your victims. Derek puts on a pair of latex gloves, a surgical mask and a visor. They’ve given me a better understanding of the nature of pain. 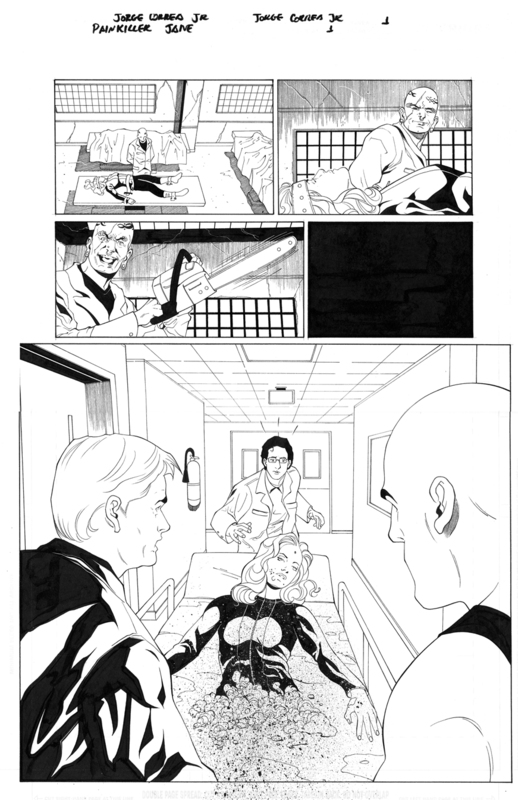 He turns around, and Jane sees in his hands a large CIRCULAR SAW. Did you know that your stomach has more nerve endings than your brain? With the flick of a switch, THE SAW WHIRS TO LIFE. Jane tries to scurry back, but she can barely move. On a scale of one to ten, tell me how much this hurts. ANDRE MCBRIDE and CONNOR KING wheel a semi-conscious Jane on a gurney through the main hallway of the Neuro-Hunters HQ. DR. SETH CARPENTER rushes toward the gurney. His eyes go wide in horror when he sees Jane. THE BOTTOM HALF OF HER BODY IS MISSING, AND BLOOD SOAKS THE GURNEY CRIMSON RED. Cool, huh? Jorge is incredibly economical with his storytelling, and he punctuated the page with a great shot of Jane lying near death, her blood literally spilling off the page. What a treat to have my words visualized by such a talented artist. This is definitely being framed and hung on the wall next to my two diplomas. They say what is played in Vegas stays in Vegas, but not with this group! What we shared in Vegas must be shared with all our readers! As they say…it was Fabulous! 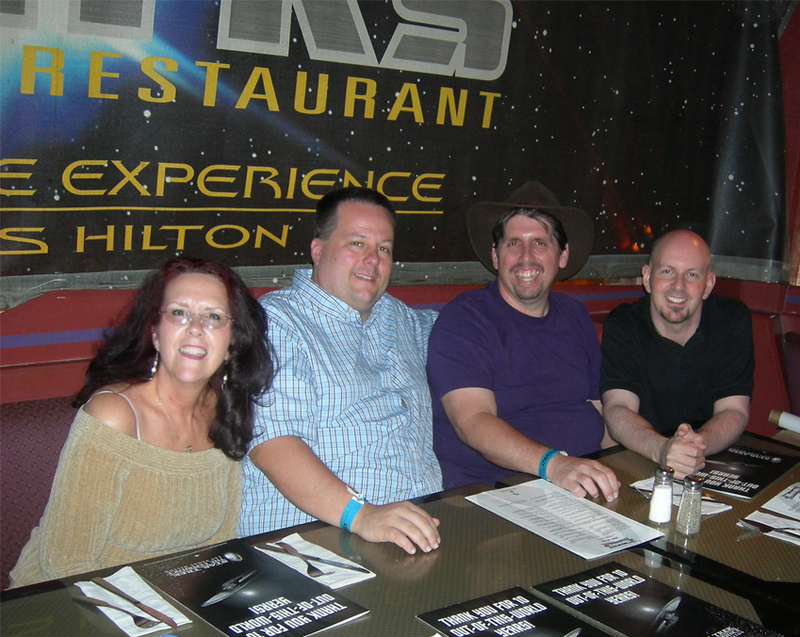 It wasn’t only the thrill of the Star Trek Convention, seeing the stars of our most beloved television/movie series up close, getting the autographs, seeing the shows, or even winning on the one armed bandits ( which now, by the way, are all computerized…I kinda miss walking around with my bucket of nickles) or the black jack tables. 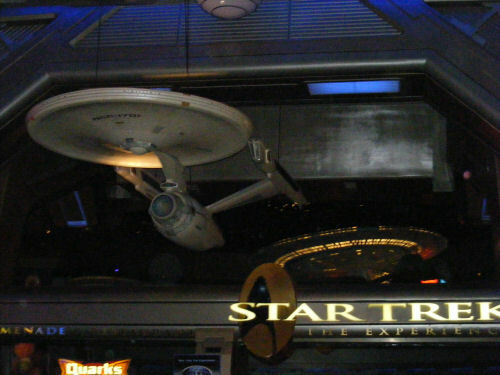 Being at Quark’s for lunch and going through the Star Trek Experience ( which sadly will close it’s doors forever on September 1,2008..[PS~ Thanks Tribble] ) was an absolutely overwelming well, experience, with memories I will treasure for many years to come. All this was breathtaking, but I must say for me, meeting and actually shaking the hands of the writers I have been closely linked to for a year now by my online connection, topped the butterflies-in-the-stomach-o-meter for sure! It was an inspiring and laugh filled time, and we had a hard time parting. For me a week just wasn’t enough. These people and their spouses are linked to me like brothers and sisters. It was wonderful to note that not just the authors/friends I met in person were into this “writing thing” 100 per cent, but our spouses were as well! We all became instant friends, instant family. How could anything be more perfect? Well, for me, it can’t. Everything we do from this point on will give me reason to sit down at this keyboard everyday and write my heart out. Because I am not only pleasing you, the reader, I am pleasing my friends: my fellow authors. Know this, dear reader: because we are commited to our craft, it will make anything you read from this group something you won’t be able to put down. But also knowing that behind the scenes there are friends and compadres who are committed to one another, will not only make our efforts a good read for you, it will make it inspired perfection from the first turn of page one to the exciting conclusion! Like with most endeavors, writing requires a break. A time to relax, a time to refresh the spirit. Sometimes that means a trip to the mountains. Or maybe the beach. Or maybe horseback riding. In my case, it means a trip to the Star Trek convention in Las Vegas! As of now, we’re on day 4 of the 5 day trek (pardon the pun! ), and it appears to be just what I needed. The sights, the sounds, the people. The whole package. The coolest thing about this trip? For the first time, 4 of our group have had the opportunity to meet, in person, for the first time. After only interacting on the net for a year, I’m proud to report it was like we had always been friends. Several of our other comrades had met weeks earlier at the Comic Con in San Diego, so we are slowly, but surely, developing some tight bonds. It is a great convention, as well. Thousands of people sharing a common love and respect. Up close contact with some fan favorites. Cool and unique ways to spend lots of money. And, only a week after Fanlib closed it’s doors, it is awesome to be reminded that fandoms are alive and well, and will never die. So, the three things I have learned so far from this trip? 1) When the book is done, it’s not really done. Last minute third party endorsements, and emergency re-write, and art issues are just a few of the things that we didn’t factor in our initial time frame. 2) Outside influences always change. Fanlib, the entity that brought us together, closed down. It is also where we were doing the bulk of our communicating, so we had to find a last minute replacement for the fanlib forum. 3) The Little Details count. Small things can drag final editing out a day or more, such as single or 1.5 spaced lines, and which symbol do we use for paragraph breaks. Yeah, they seem small, but they do matter! 4) The weather has a hand in the book. When you all live across the country, and the web is your only form of communication, a storm that knocks out the internet for a day or two can really hurt! major inspiration or just showing off? You know, during this huge collaborative process of writing a book between 9 authors who have never met, you look for inspiration in the strangest places. Some look for it in music, others look for it in quotes from dead people. I happened to find a recent inspiration for writing at the strangest of places…a bookstore! Okay, the truth. I wasn’t looking for inspiration. I was looking for an autographed copy of “Escape From Andersonville” directly from the author…the incomparable Mr. Gene Hackman. And, as you can see, a photo was also included in the package. Seriously. That’s all. No great insights. No revelations on the processes of writing. Just a time to show off a recent fun moment. And, oh yeah…check out the book. It’s pretty cool. Artifact · Found on a distant planet in the future, inexorably tied to the past, they should have left it undiscovered…The Artifact….